Below is a list of graduates from the astronomy-concentration physics degree and Applied Physics masters degree programs. These are listed with the most recent at top. Please email me with updates! Matt Nicoll (2006) - will be teaching calculus at his own former high school in Charlotte. Alex Tesar (2005) - Headed to Fort Sill, OK for Field Artillery Officer Basic Course. Then moving to Italy for his assignment with the 173rd Airborne. Randy Catalano (2005) - Entering Master's Degree Program at NC State,in Physics / Materials Science. Marissa Detschel (2005) - acquired a job with the US Patent and Trademark Office as a patent examiner. Eric Bubar (2005) -- entered Clemson and obtained a Masters degree in 2007, and stayed to pursue a Ph.D.
Craig Stutts - entered Ph.D. program in chemical physics at the University of Maryland, College Park. Kelly Kluttz - Received MS degree from ASU after BS. Spent a year teaching physics labs at Appalachian, a year as instructor at Carolina Coastal Community College., and entered graduate school Fall 2005 at the College of William and Mary. 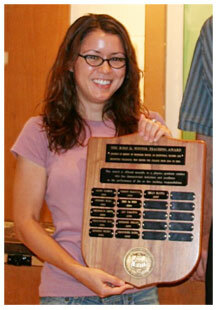 She was awarded the 2007 Rolf G. Winter Memorial Graduate Student award for excellence in teaching, shown at right (photo from College of William and Mary). Stephen Davis - entered Ph.D. program at the University of Central Florida..
Kate (McDaniel) Candillo - got a Master's degree in evironmental engineering at the University of Arizona and then joinedthe US Army Corps of Engineers in West Virginia. In 2005 she moved on to a position with an environmental engineering company called Malcolm Pirnie, Inc. Her husband is working for Grave Creek Mound, a museum in Moundsville, WV. Kate Hix - working at SciWorks in Winston-Salem and working toward a teaching certification. Shannon Hoyt - After a few years as Adjunct astronomy lab instructor at Appalachian State, she got married in 2005 and moved away. Pamela Graham - works at ASU in the College of Arts and Sciences in instructional technology support. Brian Walls (1999, double major with CS), has worked in Engineering at Gemini Observatory since graduaton. Sean League - Graduated 1998, owns Sean's Astronomy Shop, in Battle Ground, WA (near Portland). Jeff Davis - Graduated 1995, working as a Systems Analyst for Food Lion, Inc.
Mike Meyer - Graduated 1995 and is now an Engineering Support Professional at Gateway 2000, Kansas City, MO. Jim Brice - Graduated 1994, employed as a teacher. Carl Parker- Graduated 1994, and is working in the nuclear health field. Rodney Dunning - Graduated 1994, now in graduate school at Wake Forest University. Katherine Massopust - Masters degree in 1992 (dome automation thesis), and entered graduate studies at Stevens Institute of Technology. Todd Danner - Graduated 1992 and is now an Engineering Assistant, NC Dept. of Transportation. William Safley -Majored in computer science and minored in astronomy, graduating in 1992. First worked for Computer Sciences Corporation, at STScI. Has now moved on April 1, 1997, to start working on the Far Ultraviolet Spectroscopic Explorer (FUSE) project at Johns Hopkins University as a Scientific Programmer. Jeff Hammel - Graduated 1991, working in electronic sales at Sage Marketing, Austin, TX. Jimmy Zimmer: Graduated in 1990. Now at Virtus Corporation, Cary, NC. Barney Novo - Graduated 1988, now with Assured Space Access Technologies, Inc.(ASAT). Lee Hawkins -Graduated 1988, then became the first graduate student in our Applied Physics masters program, graduating in 1990. Hired as the CCD and workstation technician for the Keck Northeast Astronomy Consortium. Now the observatory engineer at Appalachian State. Matthew Combs - Graduated in 1987, then M.S. and Ph.D. in Engineering Physics at the University of Virginia. Now at Tri-Med Specialties, Inc., Charlottesville, VA.
Tracey Cooper - Graduated in 1983, Senior Telecommunications Engineer at Illuminet, Inc. (Ranier, Washington). Larry Brothers - Graduated in 1982, worked at NRAO, Green Bank, then an Array Operator at the VLA. (These are part of 250 graduates from the Department whom we track. The rest concentrated in other areas of physics. There are a like number of pre-engineering students who went through our program and transferred for their engineering degree).